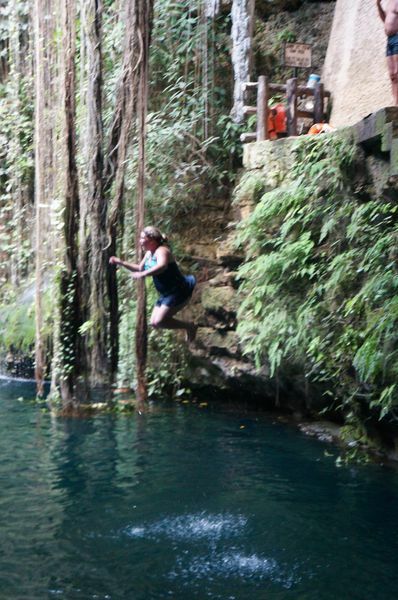 You can tell from my very first Cenote adventure that it wasn’t going to be my last. 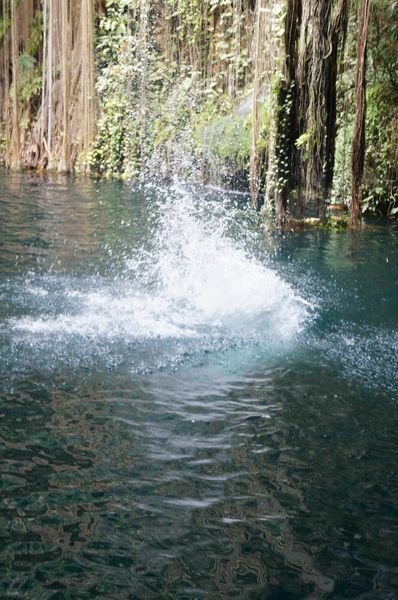 This natural phenomenon was an itch that couldn’t be scratched and I could happily spend months in Mexico visiting every cenote I could possibly see. It was with this in mind that we made plans with our new friends the Barefoot Nomads to discover some other cenotes. I did some research on the top 3 best cenotes in Mexico (near us - the Maya Riviera) and decided those were the ones we wanted to see. Top 3, best 3, best advertised, whatever; I just wanted to see more and that made up my mind. Hiring a mini van in Mexico is expensive, like over $60 per day. Hiring a car in Mexico is super cheap. Carentals.com had a mini car for $11.20 per day for 2 days or about $9 for 3 days. We decided on 2 days and wanted to include the collision damage as well, which practically doubles the price. Still less than $50 for 2 days car hire we were pretty happy. Barefoot Nomads also grabbed a car and we were set to jet. Recommended: Check cheapest prices for flights, hotels & car rental in Playa Del Carmen, Mexico. I booked the car online the night before and paid $20. This meant I had $2.20 left to pay. Mia and I walked 15 minutes to 5th Avenue in Playa Del Carmen to pick up our car from Executive Car Rental/Ace. As we waited for our turn the guy told me we would need to leave a $5000 deposit and, of course not having any credit cards with me, just cash for the $2.20 I had to walk home. Usually Josh and I both get sim cards in a country, but since I haven’t had a phone in so long (just was fixed after over a month) he was the only one with a phone. Disgruntled I walked all the way home in the hot sun, let our friends know we would be late and got my husband and baby. We decided the day was getting to warm for another walk so we jumped in a $2 taxi ride and got dropped at the car place. After Josh signed all the necessary paperwork everything went fairly smoothly. We were shown to the car, given the keys to our little white Matiz and off we went – without power steering, power windows or electronic doors, and no cruise control – CRAZY! Located: Highway 307, south of Playa del Carmen and north of Tulum on the Caribbean coast in the state of Quintana Roo, Mexico. 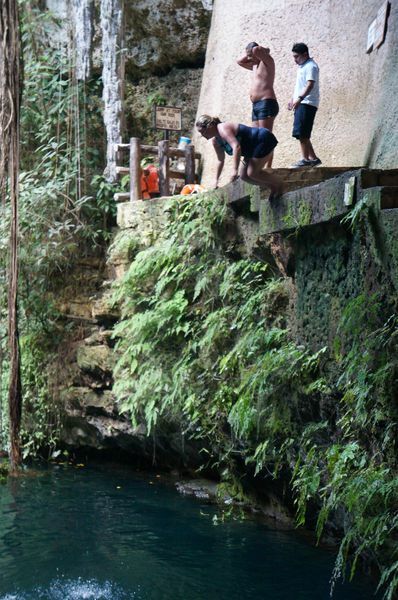 We meet the Barefoot Nomads in the shopping center carpark and headed straight out for the Two Eye Cenote. 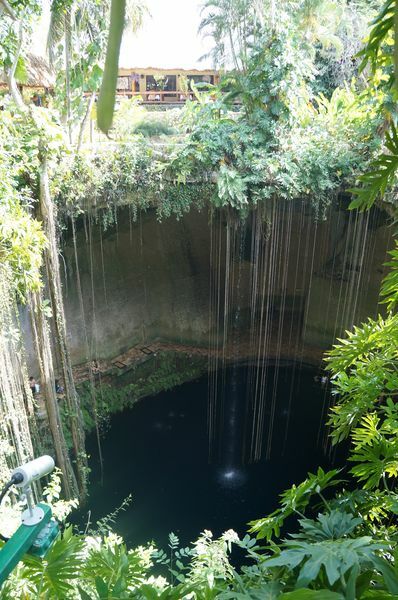 Also known as Dos Jos, because of the 2 cenotes that are joined together by short caves, like two eyes. It is documented to be a 61km underwater cave with a depth of upto 17 meters. It is also known as one of the 10 longest cave systems in the world under water. This is the one and only time I have ever been interested in scuba diving. All those divers having the adventure of their lives – wow. Walking down a small path leads you to a giant cave opening filled with crystal clear blue water teeming with fish and divers. Along the cave walls they disappear as the sandy ground drops under the cave and they go swimming through the dark. This was so far removed from our first cenote to be a completely different experience. The ground was sand, the water gorgeous and not half as scary as the Cenote Cristiano. We had a wonderful time jumping from the dock, swimming around, snorkeling, exploring. 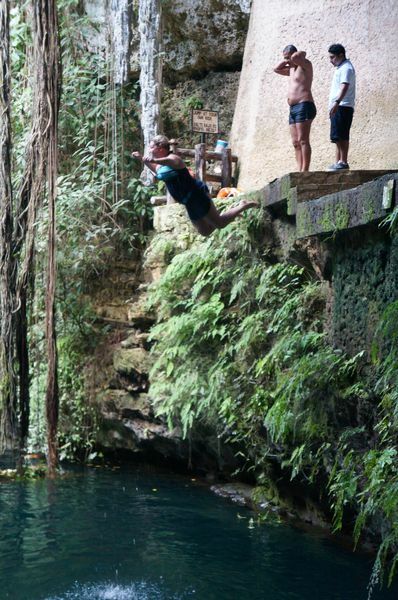 Josh jumped with his camera at one stage, which made a masterful escape to the bottom of the cenote floor. An attempted dive resulted in no camera and a sharp pain to the brain before a very helpful diver offered to go way down and collect it for him. After we had finished swimming we checked out the other cenote opening at the same location, which was also beautiful. A short walk through a cave resulted in even another beautiful pool. After Dos Ojos everyone had worked up an appetite so we stopped for some Mexican in Tulum. A quaint little town with a very hippy vibe. Located: Right outside major cross-section in Tulum. 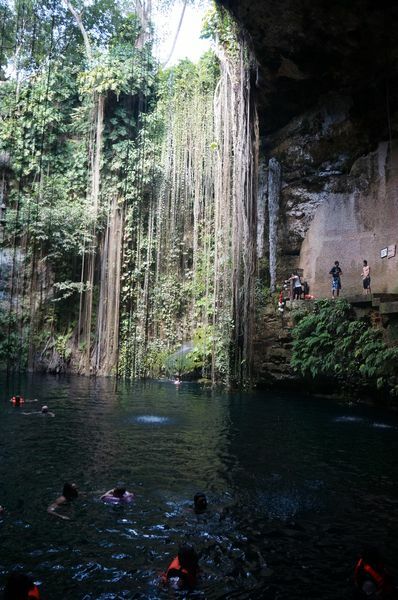 Not far from Tulum is the Gran Cenote. A small staircase down and you find yourselves with two stairwells into marvelous crystal clear, deep waters. On the right side you can swim through a cave to another cenote pool. We soon decided to relocate to the other side of the cave, as the water there was not as deep so the kids could actually stand and play on the sandy bottom. The cave is awesome. There are bats in the roof, fish in the water and again a ledge that drops away into a dark crevice. Two Cenotes in one day was more then enough for our young families and we happily finished the day with kids falling asleep in the car on the way home. On our visit to Chichen Itza with SP5.5 family we also visited Ik Kil. Located: About 3 miles from Chichen Itza. Ruins get hot and dirty and after the hours we spent at Chichen Itza we were all ready to hit a cold, refreshing cenote. From the top all you can see is a giant hole in the ground. When you get closer it’s like you are looking into another dimension. Vines and flowers line the walls of the sinkhole, as well as the occasional waterfall. Then at the very bottom, with people bobbing up and down, a great big pool of water. This water is not crystal clean like the others. It’s dark and catfish swarm it’s depths, but it is breathtaking. Ik Kil has a much larger presence of authority then any of the other cenotes. You are not allowed to take anything down to the Cenote but your towel. Lockers are for hire for 30 pesos (AUD$2.30), as are life jackets. Once we had changed and stored all our stuff we started the downhill climb to the cenote. It was deep and cave like with a few balconies along the way to check out the beauty of the cenote or to watch the cliff jumpers. My son could not wait to jump in at the bottom, whereas my daughter was scared of the catfish. The water is deep and entry is made by a pretty unsteady wooden ladder, which is hard to navigate with kids. I can’t see it’s the best one with children. There is a super high cliff jump, which Caius and Josh conquered several times, with Caius wishing to go “again” after every time. My attempt was fairly long since my courage fled at the top of the cliff. This was much higher than the last one and the sting on my chest as it hit the water was unexpected, ha! After everyone had his or her share of jumping and swimming we made the long climb back up to the top. I gazed over the edge from the top one last time to say goodbye to the cenote. All the little people swimming in the dark depths below were just gorgeous. Once back in the car we all listened to the hunger grumbles and headed to Valladolid for lunch. You can read about our Chichen Itza & Valladolid journey. I can tell you something. I am in love with cenotes. I would be happy to stay in Mexico and visit all of them. They are mysterious, dark, cool and so interesting. 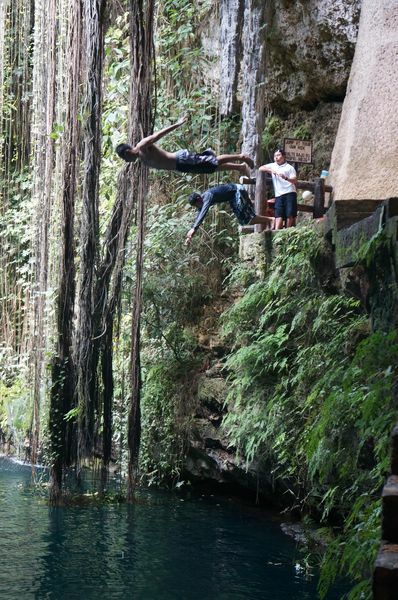 If you are heading to Mexico don’t miss the cenotes, you will be gravely disappointed if you do. BONUS: check out Art of Scuba Diving's list if you want to find even more Mexican cenotes. Next: Check cheapest prices for flights, hotels & car rental in Playa Del Carmen, Mexico. Your pics look great and it was definitely a fun day hanging out with you guys. I love cenotes as well and look forward to checking out more of them next time we're back in Mexico. Wish we could have done Ik Kil with you guys as well. Looked like fun and I would have enjoyed the cliff jumping. Looks SO fun for everyone! This looks so nice and $20 is a great price for a rental car. Hello, your photos look amazing! I can't wait to go in a few months. 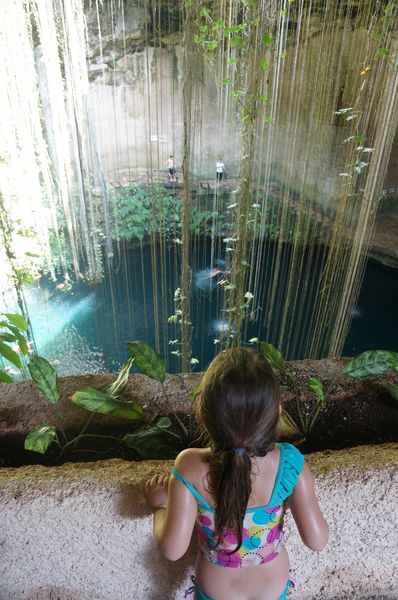 I was wondering what is the best time of day to visit a cenote. I've read it's fun when there's a lot of people but also so peaceful when you're one of the first to get there. Whats your advice? I loved the photos! I went to cenote Ik kil and it was very nice but very crowded. I went to a new place that was called Los 7 Cenotes, those were also really beautiful, you should check them out next time! who did you book your cenote excursions with?